If you have ever seen the PBS television show Antique Roadshow then you may have seen people bringing in various items they have inherited, purchased at a yard sale, or just had in their family for generations, to be evaluated and appraised. The hope of many is that the rusty fork, Snow Baby figurine, or oil painting that hung in Uncle Joeâ€™s bedroom for eighty years is of some value (perhaps great value). In most cases they have no idea the value of what they carry, but they will stand in a line for hours to find out (and to perhaps be on television). They are suspicious that the item has some value, but no idea of how much, and there is lingering hope that their toy, glass vase, or ring will make them rich. In Matthew 13 Jesus has been presenting a series of parables (ex. â€œa sower went out into a field,â€ the mustard seed and leaven) in which he is teaching on the kingdom of heaven. For our purpose, I would like to focus on Matthew 13:44, and how it relates to the discovery of a great treasure and what we should do with it. What is the â€œkingdom of heaven?â€ We see this phrase repeated several times in the surrounding text. Jesus is using this phrase in the place of salvation, relationship with God, the gospel, etc. Specifically, it is how Jesus had come to be the way of salvation for mankind. This gospel (good news) that he offers is the only means of salvation and means to restore our broken relationship with God (John 14:6). 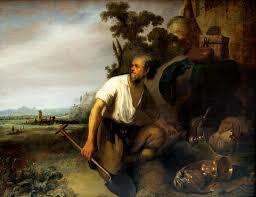 The man in the parable is doing something in a field that does not belong to him, and he finds/discovers a treasure. It seems to imply that he is digging, finds the treasure, and then covers it back up. But what is the treasure that he finds? It is something that brings joy because of what it provides, or how it changes oneâ€™s life. Whatever was lacking now has been fulfilled. The salvation that Jesus provides gives joy to those that receive it because of it’s great worth. I. There is recognition of the value of the treasure. How valuable is the â€œkingdom of God?â€ We see that the man sells all that he had in order to obtain the field (where the treasure was re-buried). We can not purchase our own salvation, but we must give up everything in order to be a follower of Jesus (Luke 9:23). It is not an exchange for what we give up has no eternal value. But what we obtain is of eternal value and is priceless. This is faith — giving up of what we hold in our hand to posses something promised in the future (Hebrews 11:1). II. The treasure is discovered and a decision has to be made. When the man discovers the treasure he instantly recognizes it value. There is no promise that the treasure will be there tomorrow. What if someone saw him discover it, or hide it? From the text we get a sense of urgency. When we encounter Jesus and His offer of salvation, do we go on with our lives as though it is not there or do we stop and do whatever it takes to obtain this great treasure? It has everything to do with how valuable you determine the treasure to be. In the Antiques Roadshow program when a woman is told that her great auntâ€™s desk is worth $200,000 she will jump for joy in excitement. Just yesterday her kidâ€™s were putting stickers on it, and jumping off of it onto the couch. Now all that changes â€“ the desk is worth a lot of money (now). How she treats it changes drastically.Â Â The truth is that it has always been very valuable â€“ itâ€™s just that now the woman understands itsâ€™ value. In the parable, the treasure was always in the field, the must just had to discover it. In Matthew, the man in the field understands the treasureâ€™s value, and acts accordingly. Do you know how precious the gospel is to mankind? Whether we understand itsâ€™ value does not change itâ€™s true value. The value only changes in our own minds. Isnâ€™t it amazing that for many Christians we see the initial value of the gospel and cry our for salvation, only to become so familiar with grace that itsâ€™ value diminishes over time. So once we discover it, and we understand itâ€™s value, then what? III. There are steps to take in order to obtain the treasure. The man in the parable â€œgoes and sells all that he has and buys the field.â€ One must give up all that he has. There is a purchase of the field but we see from other Scripture that we cannot purchase our salvation. Christ died on the cross in order to pay the sin debt that was owed. We must be willing to walk away from everything to follow Christ (Luke 9:23). One is not â€œjust savedâ€ as the early Roman Church believed simply because you lived in a particular area, or their family went to a specific church. It is an individual decision everyone must make on their own. Salvation is offered as a gift that one receives or rejects (Romans 9:23). Like the treasure in the field, you have to do something with this treasure. It is my prayer for you that if you are already a believer that you will ask the Lord to help you have an ever increasing view of salvation. And if you are standing their with the treasure in your hand, that you will do whatever it takes to make sure that it becomes your own (today).